Anaheim is one amazing city. It was after Disneyland opened in 1955 that the development boom began. Hotels, residential districts, and industry grew over the years. It is no surprise that in this nexus of entertainment and business there are some fantastic places to dine. Here are some top eats for you to salivate over. “Craft Your Story” is the slogan for this build-your-own pie joint with a fun newspaper theme. The Pizza Press also offers a great variety of craft beers on tap and fresh salads. Ideal for families and all ages, The Pizza Press is located in the heart of Anaheim within walking distance from Disneyland’s main entrance. When you have a hankering, there is no denying the call of comfort classics. Roscoe’s Chicken and Waffles is perhaps the pinnacle of this famous combination of breakfast and dinner. This family eatery does fried chicken right. Crispy outside and tender and juicy inside. Pair this with some of the best waffles in town, and you have a real crowd pleaser, not to mention the greens, red beans and delicious cornbread. The restaurant is located just down the street from Disneyland, on Harbor Boulevard. 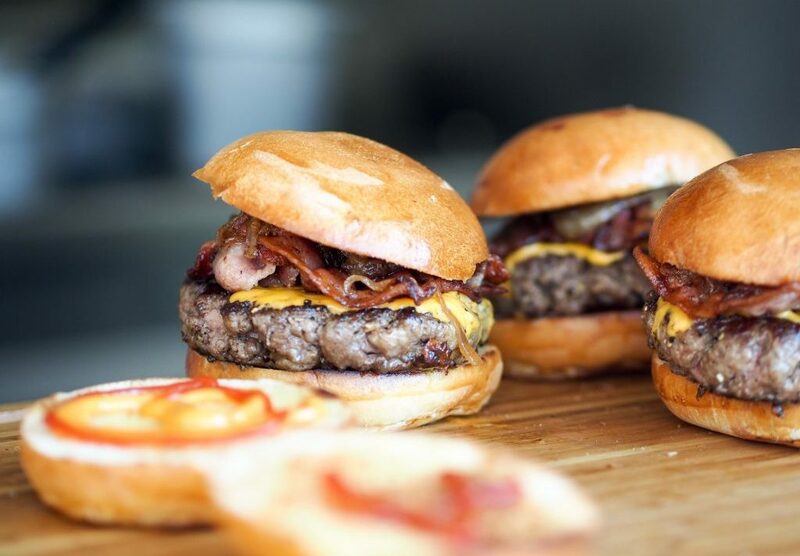 Umami Burger crafts a variety of scrumptious burgers and chicken, from the classics to the outrageous. And if eating meat isn’t your thing, but you still love a good burger, have no fear. They offer burger patties that are entirely plant-based yet have all the texture and flavor of a real beef burger. This quality is all due to a partnership with Impossible Foods. Umami is located about a ten-minute drive north of downtown on Anaheim Blvd. Mama Cozza’s is a jewel of family-owned Italian fare and has been in business since 1965. Steeped in tradition and serving only the very best pizza and pasta in Anaheim, Mama Cozza’s sauces are made from scratch for every dish. Located about 2 miles west of Disneyland, Mama Cozza’s is an Anaheim eatery you won’t want to miss. The whole family is in for a treat. The Anaheim Packing House is a renovated orange packing facility that’s now a 2-story gourmet food hall. If going to get something to eat was an adventure, this would be the setting. No matter what you are hungry for, it’s here. The Packing House is perfect for adults and teens who like to wander and discover something new. The Packing House can be found at 440 S Anaheim Blvd. If you’re looking for an upscale steakhouse dinner, this is the place for you. Executive Chef Michael Rossi and his culinary team are hard at work in the kitchen to serve up seasonal classic American cuisine. The restaurant also features a lively saloon and line dancing. The Ranch is located at 1025 E Ball Rd, Anaheim. Capping off our dining tour of Anaheim is Roy’s. This restaurant is a high-end dining experience with a unique culinary twist. It’s Hawaiian Fusion cuisine. Every dish combines the very best of American and Japanese cooking tradition. Roy’s is located at 321 West Katella Avenue, just south-east of the Disney Parks. It’s true that in Anaheim, one could make an entire holiday centered around the remarkable food that this famous city has to offer. Grab a bite that the whole family can enjoy!